Every spring, the NLG organizes regional conferences to bring together attorneys, law students, legal workers, allies and activists across the country. Featuring panels, trainings, workshops, and social events on topics of interest to the progressive and radical legal community, regional conferences also provide the opportunity to build community and strategize for the struggles ahead. NLG regional conferences are open to all, so non-NLG members are welcome (although you’ll probably be convinced to join by the end)! Spring 2019 NLG Regional Conferences TBA! Join us on Saturday, April 14, 2018 from 9 AM to 4 PM. 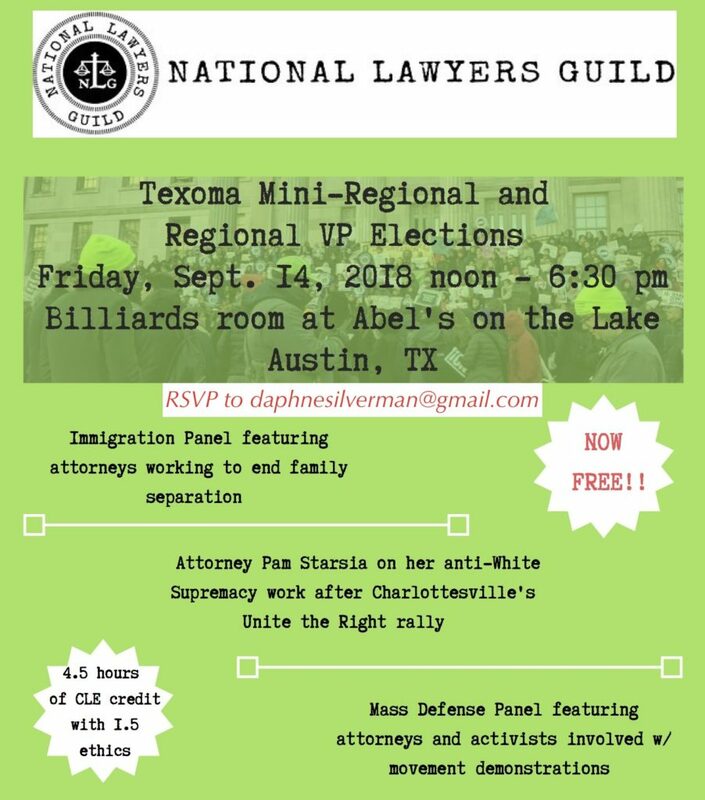 for the NLG Mid-Atlantic Regional Conference in Baltimore, Maryland, hosted by the Maryland Chapter of the National Lawyers Guild. REGISTER NOW via the Facebook Event page or Eventbrite! Early Bird rates have been extended until MLK Jan 15th! Light breakfast/coffee, and lunch included for all Saturday day events. We will have two different volunteer activities to chose from both will be offsite in Clarkston about 20 mins away from Atlanta. 1. Volunteer Activity*: Help out at the Family Preparedness Clinic – Helping refugee/immigration families potentially facing deportation fill out legal papers like Power of Attorney, assigning guardianship etc. . The number of ICE arrests has increased by 75% since last year. Some articles on it here and here. 2. Volunteer Activity: Naturalization Clinic for high school students and their families at Clarkston HS. Help refugees and other immigrants became US Citizens. Being a citizen is the only way to protect your family from deportation. Posted in Announcements, News and tagged CLE, Regional Conferences.